Glorious Meals Pure & Simple A GENERAL INDEX, with more than 350 recipes! A GLUTEN-FREE INDEX, with natural and delicious gluten-free adaptations of more than 250 dishes! A PASSOVER INDEX, with more than 250 Passover-friendly recipes! 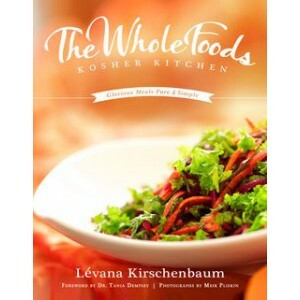 With her latest book, The Whole Foods Kosher Kitchen: Glorious Meals Pure and Simple, Levana embarked on her most ambitious journey yet: to present a beautiful, comprehensive compilation of her life's work, her Magnum Opus as she calls it: The hundreds of dishes she shares are at once economical, easily prepared, and absolutely irresistible: Serious ingredients, fun dishes: This is her motto, even when it comes to dessert.